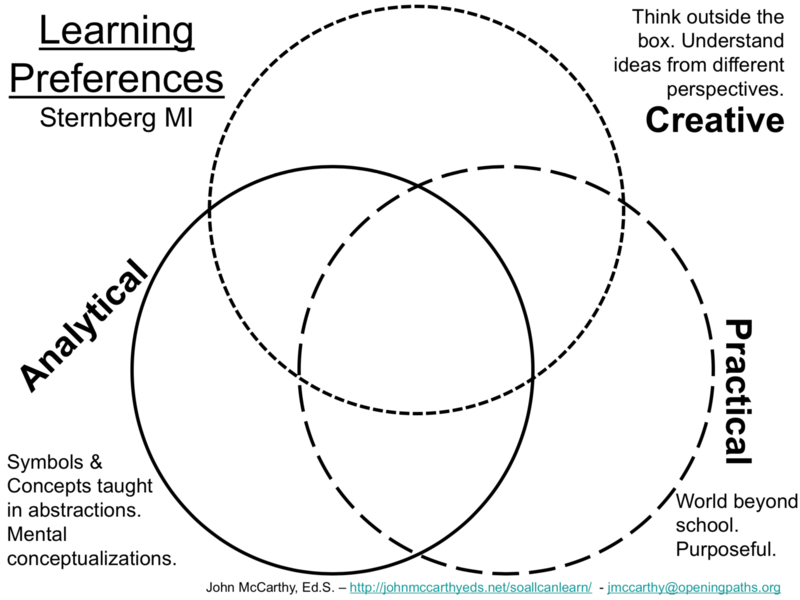 Join me through this blog on Opening Paths, especially the resources and follow me on Twitter @JMcCarthyEdS for open dialog about what our students need, and what we as professional leaners seek to understand. Contact me for dialog, coaching, and to inspire your staff along their pathways to helping all students learn and achieve. 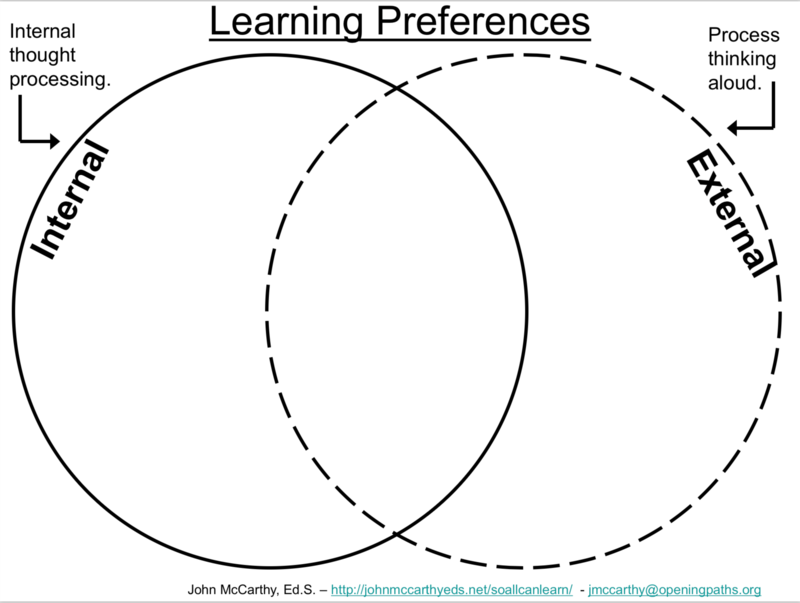 Student Learning Preferences Quick Surveys by John McCarthy, Ed.S. The more we know about our students think and process data and complex concepts, we can be more effective with supporting their learning. “Ignorance is bliss” may be a cliche that satisfies some, but educators cannot afford such beliefs in our work to ensure that students have the best learning opportunities. The Student Learning Preferences Quick Survey is a collection of charts that students complete during a 5 to 15 minute period. It’s different from the strategy: Learning Profile Cards, which is a more individualized approach. The quick survey provides a group snapshot of the learning culture. The timing depends on the number of charts use. 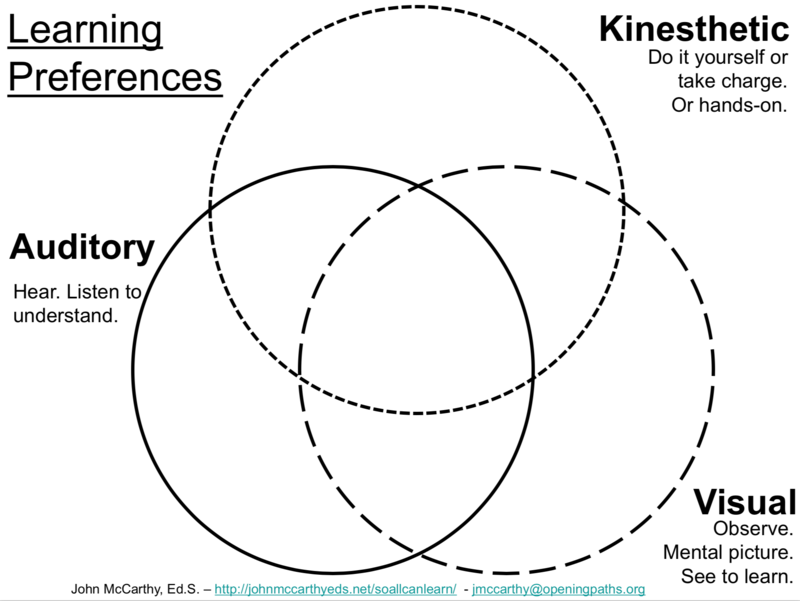 My Learning Preferences Quick Survey posters includes three charts. Each represents elements of thinking styles. 1. Post the posters set on a wall For letter sized posters, you may need to post a second set on a different wall for every 15-20 students. This will allow for readability and data collection when the activity is done. 2. Describe each of the learning profile elements Use student-friendly language. Explain each element in terms of how the student might use it or experience it in their daily life. For example, practical thinkers want to know how a concept or skill is used in something they do outside of school. A visual thinker may give directions to a location as they see themselves taking the journey. 3. Have students place their initials on each chart Students will place their initials where it best describes their way of thinking. Spatial placement is as important as the category they choose. Some students are more strongly one type, while others have more combinations of different thinking styles. Once the charts are completed, they are useful for getting a balcony view of the student group. You can use or adapt strategies to meet learner needs based on the chart results. Make a copy of the chart to review the results for your instructional planning. One teacher who used this strategy said that before each class started, she reviewed the charts for that session. It reminds her of the learner culture dynamic for that specific class. Another teacher said that she once took down the charts because she needed the space for something else. The students demanded that the charts be returned to the wall. They liked to remind themselves of the learner culture. Student Learning Preferences Quick Surveys provides important data for meeting student’s needs. Helps teachers to differentiate for content, process, and products to improve student learning. Students also benefit from the experience as they learn about themselves and others. Thank you for the wonderful idea of putting up the posters for learning and thinking styles. I will definitely be using these this coming school year. My desire is to be a more effective teacher and ensure the learning success of my students. I am hoping that this will give me a better understanding and a constant reminder of the needs of my students. I thought the poster were very helpful and I plan to use them in the upcoming school year and share them with my colleages. To use in their classrooms as well to increase student learning and awareness. That’s great to hear. I’d be very interested how it goes. It’s good to hear how these are used with students. Thanks.